Today I’m wearing orange for World Kidney Day. To be honest, before researching for this post, my knowledge of kidney health was limited to a book I read as a kid called Saving Jessica in which Jessica needed a kidney and her boyfriend, Jeremy, gave her one. No need to read that book now! But last summer, a friend of mine repelled down a friggin’ building to raise money for the National Kidney Foundation, so I figured it must be a pretty important cause. Most people know that we need our kidneys to remove waste and excess fluid from the body when we pee. But the kidneys also function to balance the salt, potassium, and acid content of our bodies, keep our blood pressure controlled, and produce red blood cells to keep our bones strong. Unfortunately, around 8-10% of the adult population have some form of kidney damage. There are a number of ways you can work to keep your kidneys healthy. First and foremost, maintain a healthy lifestyle by keeping a healthy diet, staying active, hydrating, and NOT SMOKING. Monitoring your blood sugar and blood pressure levels is also a good idea as is limiting your use of over-the-counter drugs. But some people experience some form of kidney failure anyway, so what can you do? 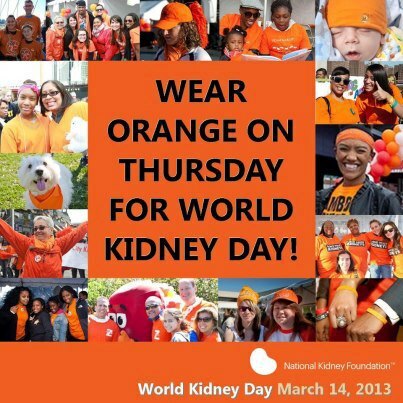 First, like me, wear orange today to show your support of World Kidney Day! Become an organ donor and donate money OR time to the National Kidney Foundation or attend a World Kidney Day event in your area. Finally, spread the word about kidney disease, and if you or someone you know seems at risk for kidney failure, get regular screenings from your doctor. Early detection can help prevent kidney disease from progressing to kidney failure! And now, a word from World Kidney Day!